I'm sorting through my photos, postcards, and other artifacts from my trip, and it's a bigger task than I had thought it would be despite the limited collection. I broke my grandparents' cardinal rule and didn't label my photos. They're all in a jumble, so I'm having to go back to the negatives to attempt to put them in chronological order. Somehow we all five fit in there fairly comfortably. We stayed in a pension in Vienna the first two nights, and then drove to this campground outside of Bruno. It was pretty nice with a big bath house and a restaurant nearby where we ate most of our meals. We didn't realize it at the time, but they were some of the best meals we would have during the trip. The first evening there we went up to a castle with a broad overlook. 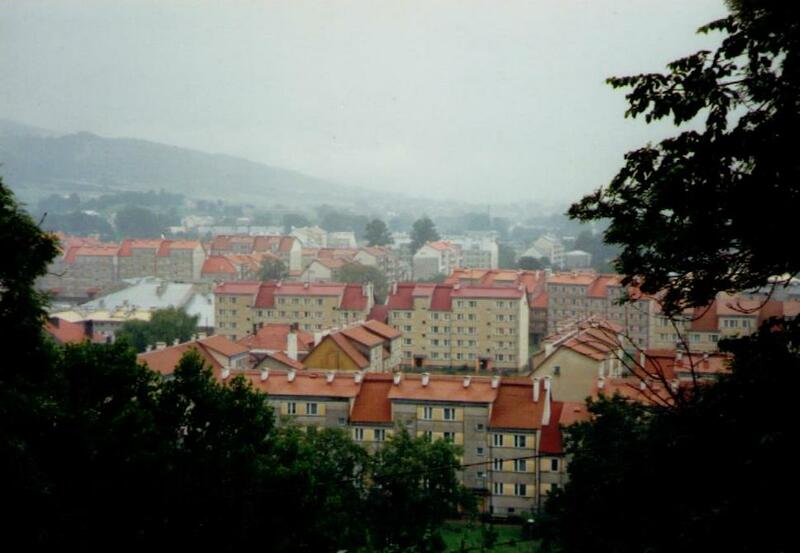 Bruno was, at the time, the 3rd largest city in Czechoslovakia, (now it's the 2nd largest in the Czech Republic). Although it was clearly a relatively large city, my memory is that it was very quiet, almost deserted by evening. It seemed that we were some of the only tourists in town, certainly the only Americans.